One of the first vegetables gardeners grow is often the bean. The seeds are large and easy to plant, they germinate and grow quickly, and the pods are tasty. 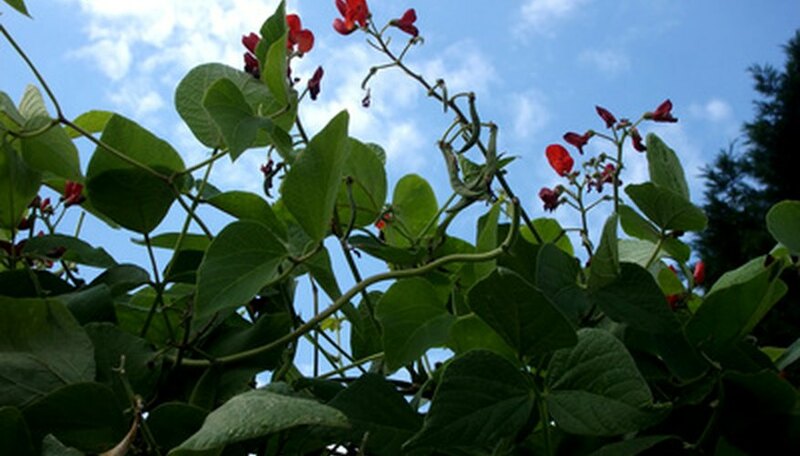 The twining vines can cover teepees and unattractive fences, and the flowers, usually white, are bright red in the scarlet runner bean. Few other crops offer such a bonus of beauty in addition to providing food. Beans have a network of roots that both anchors the plant securely into the ground and absorbs the water and minerals it needs. Each root has tiny, thin-walled root hairs whose walls are thin enough for water and dissolved nutrients to pass through. Like all legumes, beans have nodules on the roots that contain bacteria that take nitrogen from the atmosphere and convert it into ammonia, a form that can be used by the plant, making it less dependent on the nitrogen in the soil. Beans are vines, with long thin stems that can twine around string or small branches, though some varieties, known as bush beans, have shorter stems that need no support. The tips of the vines are able to move back and forth to find and wind themselves around anything thin and vertical. The stem can transport water and nutrients upward from the roots to the leaves and carbohydrates and proteins from the leaves downward. Bean leaves are divided into three oval or heart-shaped leaflets, each one attached alternately to the vine by a short stem, the petiole. They are rough and often slightly hairy. The leaves contain chloroplasts that produce food for the plant by photosynthesis, a process that takes carbon dioxide and converts it into organic compounds, mainly carbohydrates, using the energy of sunlight. Like all legumes, beans have asymmetrical flowers with petals fused into distinct upper and lower sections. Petals can be white, red, peach or lavender, depending on the species and variety. The stamens, the male organs containing the pollen, and pistil, the female organ containing the ovary, are sheltered by the lower half. Each flower is attached to the stem by a petiole. After the flower is fertilized, the ovary develops into a long green pod containing six or more growing bean seeds. The pod elongates and thickens, finally turning brown and drying as the seeds inside mature.